Advantages: Variety of content, interesting feature articles with included scale plans, good range of reviews, excellent artwork. With six issues coming out annually, this is the penultimate issue of Windsock International for this year. Its 32 pages are once again full of material that will be of interest to those modellers with a leaning towards World War I aviation. Thanks to the large format of the magazine, items such as period photographs, artwork, and scale plans are all reproduced to a very high standard. Centre stage in this edition has to be the Handley Page V/1500. Along with the numerous published photographs, Colin Owers has described and drawn this behemoth. The general arrangement drawings are in 1/72 scale with Ronny Bar providing the excellent colour profile. Number four in George Haddow’s continuing series on Austro-Hungarian naval aeroplanes is the Lohner Type X. As well as a summery on the history of the aircraft, the author contributes detailed 1/72 scale plans, accompanied by Bob Pearson’s accomplished artwork. Albatros D.V 2065/17 is revisited with a look at the famous dragon marking of this Jasta 5 machine. It seems there are still doubters out there about the recently revised profile of the aircraft flown by both Oblt. Richard Flashar and Ltn. Hans Joachim von Hippel. 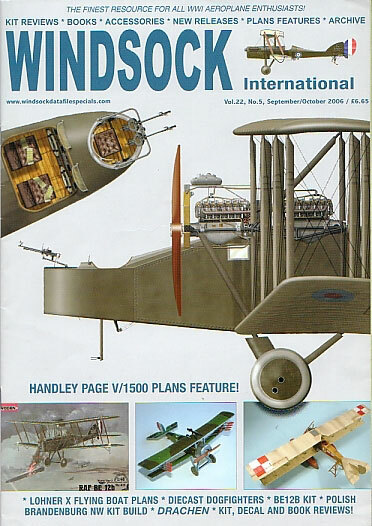 This issue’s modelling feature is concerned with the Hansa Brandenburg NW floatplane. The basis is the resin 1/72 scale model by Pancerka. Detailed colour photographs follow Wojciech Butrycz’s assembly process and his text explains the process needed to complete this challenging project. Of course there is the usual roundup of book, kit, and decal reviews, which along with the latest news in the industry make this publication a fine resource for all WWI aircraft enthusiasts.